The alarm clock goes off, you flip on the light switch and the automatic coffee maker starts brewing. And while these actions are simple and mundane, the electric grid that powers our everyday electric devices is a vast and complicated system. 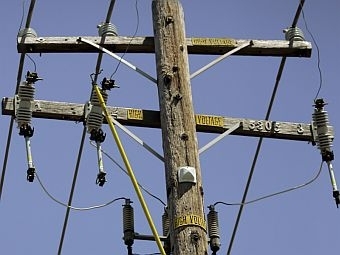 On Tuesday’s Vermont Edition: everything you wanted to know about how the electric grid works. As people in our region debate the best ways to generate energy, we’ll take a look at the infrastructure that transmits electricity from massive generating sources to our homes and offices. We talk with Paul Hines, professor of electrical engineering at the University of Vermont, who’s research focuses on the stability and vulnerability of the electric grid. Also in the program, cartoonist Ed Koren is well-known for his squiggly, hairy characters that appear regularly in The New Yorker. Since the 1960s, Koren has had more than 1,000 of his cartoons published by the magazine. He works out of an old farmhouse in Brookfield, where we pay a visit to Koren’s studio to learn how he approaches cartooning. And we head to a local farm to learn the long-lost skill of milking a cow by hand. This story by Jane Lindholm recently won a national award for use of sound from the Public Radio News Directors. The Shumlin Administration wants the public to have more of a role in managing Vermont’s statewide electric grid. The suggestion for more public oversight comes as regulators review the planned sale of Vermont’s largest electric company. Things looked bleak a year ago when dairy co-ops stopped making pick ups at Vermont’s county fairs, and farmers didn’t know what to do with all the milk coming from the cows on exhibit. But now, there’s "Dairy on the Moove".